Should You Pay off Your Credit Card or Save Your Money? Sometimes, it can seem there’s not enough money in your budget for everything you need to do. You already know it’s important to pay down debt, especially high-interest consumer debt such as credit cards. And you know you need to save money. But what happens if you only have enough leftover cash in your monthly budget for one or the other? Is it better to pay off a credit card or save? The answer depends in part on your financial situation and on your credit card. If you’re asking yourself “Should I pay off my credit cards or save money?” you need to evaluate. Are you saving money for a specific purchase or for an emergency fund which helps you pay for necessary bills during a crisis? If you’re saving for a purchase, it’s generally better to pay off your credit cards first because you can almost always wait to purchase another item. If you need financing for a big item such as a car, paying off your credit card first can actually help you land a better loan rate anyway. If, on the other hand, you have no savings and you have credit card debt, you could be in a precarious situation. If there is a sudden emergency, you may find yourself getting deeper into debt because you don’t have emergency funds on hand. This can make it harder to break out of credit card debt. Is Your Credit Interest Rate High? Take a look at your credit card interest rate, too. If it’s high, it’s best to pay it off first. You may be paying a lot of money each month for the privilege of carrying a balance, especially if it’s on the larger side. Contact your credit card company if you have been paying regularly to see if you can get your interest rate lowered or consider switching your balance to a lower interest card to make it easier to pay off. If your interest rate is high, paying it off first makes sense because you only earn a small percentage on your savings. This means you’ll end up losing money because you’re also paying high interest on your credit card. Any interest on your savings will be canceled by your credit card costs. Do You Have a Good Credit Card Interest? On the other hand, if your credit card has a good interest rate, it may make more sense to get some savings together for an emergency fund. Consider saving up about three months’ worth of expenses and then focusing on paying off your credit card. This way, you won’t get further into debt, even if an emergency happens. Then, you can pay off your credit card. In the end, it can be a delicate balancing act. Generating some savings can certainly protect you in the event of an emergency. At the same time, getting out of debt quickly can help improve your overall financial picture and can also free up space on your credit card for when you need it. If you’re still wondering “Should I pay off my credit card or save?”, consider using our pay down your credit card calculator. Money Help Center provides this calculator and others at no charge, so you can get some financial answers with no obligation and no cost. 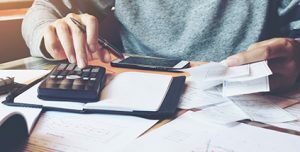 Since these calculators are not associated or affiliated with any lender or bank, they are unbiased and can help you make better financial choices in the future. How close are you to paying off your credit card debt?